For President Trump, a prime-time presidential address to the nation was a radical experiment in conventionality. The first results back from the lab were not an indication that he should stop winging it and become more disciplined in the mold of predecessors. Here was one of the most traditionally powerful platforms available to a president—one camera, one leader, speaking to millions from the Oval Office—turned over to the improvisationalist in chief, the most nontraditional communicator ever to occupy the White House. Trump, according to reports, has been telling people that he didn’t want to do an Oval Office speech, the first of his presidency. If true, whoever pushed him to do it might be squirming a bit in the Wednesday morning staff meeting. Trump is one of the great innovators of the age when it comes to political communication. 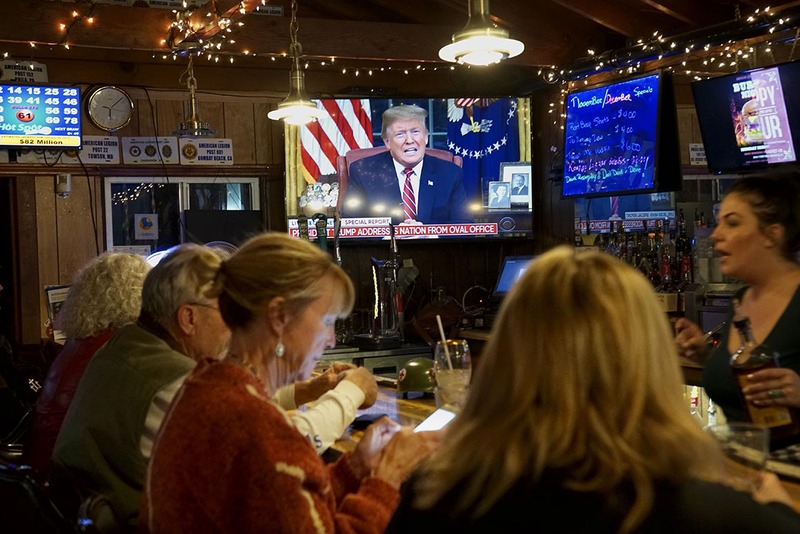 His mastery of burst-like, spontaneity-driven formats like Twitter or friendly cable TV shows rallies supporters, outrages opponents—and reliably dominates the agenda of what both groups are talking about. More formal and classically presidential settings, which had a way of making predecessors seem larger than mortal politicians, sometimes seem to have the opposite effect on Trump. The first wave of commentary on Tuesday night turned mainly on such stylistic grounds. But in a high-profile confrontation of the sort Trump is engaged in now with congressional Democrats over the partial government shutdown, the substantive outcome is often driven by theatrical dimensions. One reason modern presidents more often than not win such standoffs—whether it is Ronald Reagan firing the air traffic controllers in the early 1980s or Bill Clinton euchring Newt Gingrich during an earlier shutdown in 1995—is precisely that they can use the potent White House platform to shape the prevailing narrative about who is on the side of right. The opposition—typically not one voice but a diffuse and poorly synchronized chorus of voices—has trouble responding in kind. In addition, presidents also have unparalleled ability to make news on command. One notable feature of Tuesday night’s address was that it lacked real hard news of the Associated Press variety: No announcement of an executive action, no new bargaining chip offered. Trump’s language was somewhat new—though it had been presaged by remarks from the president and surrogates in the days before—but even this rhetorical shift could be interpreted as an indication that the president so far is not winning the public relations contest over the shutdown and needs a softer message. He sought to frame his insistence on a wall to inhibit illegal immigration on compassionate grounds, not simply on economic and public safety grounds. Among the victims of the status quo, he said, were women and children who never should be encouraged to attempt dangerous journeys to the United States in the first place, and wouldn’t if the borders were more tightly sealed. If the prime-time speech was not the most natural format for Trump—no crowd to roar approval, no skeptical reporter to joust with—it must be said that neither was the official response for the Democratic leaders, House Speaker Nancy Pelosi and Senate Minority Leader Charles Schumer. Like Trump, they are both commanding communicators in comfortable settings, fielding questions on Capitol Hill or rallying their caucuses. On Tuesday night, they stood awkwardly side by side, both looking at the camera rather than each other, Pelosi speaking first and then Schumer, neither breaking new ground in their arguments. Twitter exploded with jokes that they looked more like grandpa and grandma lecturing a wayward teenager than the leaders of the opposition. Cumulatively, both addresses may have been a sign of the times: Perhaps, in the age of TiVo and Netflix, the whole ritual of “stop everything, take a seat on the couch, and give our leaders the respectful hearing they deserve” prime-time addresses is a bit of anachronism. At least under the present circumstances, in which the leaders were not addressing some dramatic new circumstance but simply amplifying the ceaseless partisan volleys they deliver all day in the 12 hours before prime time. If so, that also suggests the handwringing debates held by traditional broadcast networks—should we accede to the president’s request for air time?—are themselves a bit of an anachronism. Simply put: Who really cares whether they do or they don’t? The debates about giving presidents a prime-time platform, for speeches or news conferences, flowed from the days when the big networks overwhelmingly commanded the main avenues of public attention. Of course, if prime-time Oval Office speeches are an outdated form in the Trump era, so too may be grading them on style points, as this very piece is doing. In a polarized climate, opponents would jeer even eloquence from an unwelcome source; partisans would chant lovingly for public incontinence if delivered on behalf of the home team. Still, this is a different era for presidential communication, as Trump usually knows better than anyone, and as he forgot for a few clumsy minutes on Tuesday night.